The Red Sox announced that they have acquired infielder John McDonald from the Philadelphia Phillies in exchange for Salem relief pitcher Nefi Ogando on Saturday night. The Red Sox also received cash considerations in the deal. Trading for McDonald on Saturday allows the Sox to potentially include him on their postseason roster. The club will announce a move to clear a spot on the 40-man roster for McDonald later this evening. The 38-year-old McDonald is known as an outstanding defensive infielder, and will provide backup at shortstop, second base, and third base. He has played with the Indians, Tigers, Blue Jays, Diamondbacks, Phillies, and Pirates over the course of his 15-year major league career. Two days after being named an Eastern League All-Star, Portland right-hander Anthony Ranaudo was named the circuit's Pitcher of the Year on Saturday as voted on by league managers and media members. 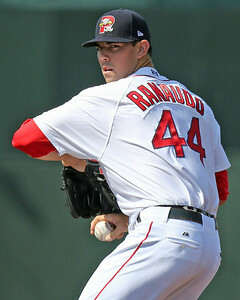 In 19 games with the Sea Dogs, Ranaudo went 8-4. He struck out 106 batters in 109 2/3 innings, posting a 2.95 ERA. He had league-leading marks in WHIP (1.09) and batting average against (.204) at the time of his promotion to Triple-A on August 2. He was also third in ERA, tied for seventh in wins, and tied for eighth in strikeouts. He was named SoxProspects.com Pitcher of the Month in both April and May. 7/31 Cup of Coffee: Two PawSox outfielders, using crafty baserunning and timely hitting, combined to give Pawtucket a walk-off victory. Portland and Salem won in blowouts, while the Drive dropped both halves of a doubleheader. The Spinners and GCL Red Sox won on the strength of their pitching, and the DSL Red Sox lost by one run. The Pawtucket Red Sox took home a bottom of the ninth walk-off victory beating the Syracuse Sky Chiefs (WAS), 2-1. It was an inauspicious start for the PawSox, who entered the ninth inning knotted with the Chiefs at 1-1. After a pair of strikeouts to start the inning, Quinton Berry walked and, with Justin Henry (pictured) batting, stole second base, his 17th of the season. Henry then singled to center field, scoring Berry and ending the contest. While the late-inning heroics at the plate seized the victory, it wouldn't have been possible without solid performances from the PawSox pitching staff. Led by starter Clay Buchholz, who was making a rehab start, four pitchers combined to scatter seven hits, walk one and strike out nine in the game. Buchholz, who only lasted 3 1/3 innings, gave up all seven hits and the Sky Chiefs' only run. Starter by trade Anthony Ranaudo pitched four perfect innings in relief, striking out five. PAWTUCKET, R.I. -- Pawtucket Red Sox manager Gary DiSarcina had just one piece of advice for right-hander Matt Barnes prior to his Triple-A debut on Thursday night. "We tell all the guys who come up here, 'just be yourself, don't try to do too much,'" DiSarcina said. "Whether you go from Double-A to Triple-A [or] Triple-A to the majors, you get yourself in trouble when you try to impress and try to do too much. For me, it's just relax and pitch your game." 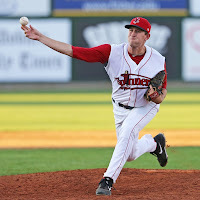 Barnes managed to do just that against the Syracuse Chiefs (WAS) in his debut, displaying his typical 91-95 mph fastball during five scoreless innings of work in which he struck out seven, walked two, and allowed three hits. The 23-year-old showed off his full repertoire in the start, using a 76-78 mph curveball four times to dispatch Syracuse hitters while mixing in a 83-87 mph changeup among his 86 pitches. Right-hander Matt Barnes (pictured) was promoted to Triple-A Pawtucket this week. 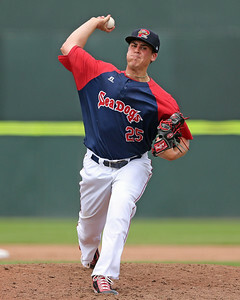 The eighth prospect in the Red Sox system according to SoxProspects.com made his debut Thursday night, tossing 5 2/3 innings, allowing just three hits and two walks while striking out seven. SoxProspects.com Staff Writer Kevin Pereira was in attendance for the outing, and spoke with PawSox manager Gary DiSarcina afterwards about what he saw out of the right-hander. DiSarcina liked the way he didn't try to do too much and was aggressive on the mound. Barnes' former Portland teammate, right-hander Anthony Ranaudo, was named a year-end Eastern League All-Star. The 23-year-old hurler is the first Sea Dogs representative to receive the accolade since 2011. SoxProspects.com Editor-in-Chief, Mike Andrews, speculated on potential September call-ups in his weekly ESPNBoston article. The SoxProspects.com podcast team got together to discuss the recent promotion of Xander Bogaerts, the hot performances of Mookie Betts, Henry Owens, and Manuel Margot, as well as the selections for the Arizona Fall League. 8/30 Cup of Coffee: Another Red Sox affiliate has punched its playoff ticket: With its win, Salem clinched first place in the Carolina League Sothern Division. Pawtucket moved one game closer to a playoff berth, Portland kept its slim hopes alive, and Lowell inched closer to the postseason as well. The GCL Red Sox won but were unable to move up from the third seed, while the DSL Red Sox fell in the opener of their series. 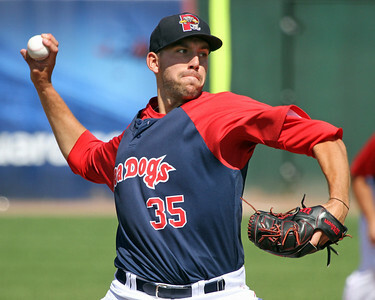 Matt Barnes lifted Pawtucket in a pitcher's duel in his Triple-A debut, a 2-0 victory over the Syracuse Chiefs (WAS). Barnes allowed three hits in 5 1/3 shutout innings. 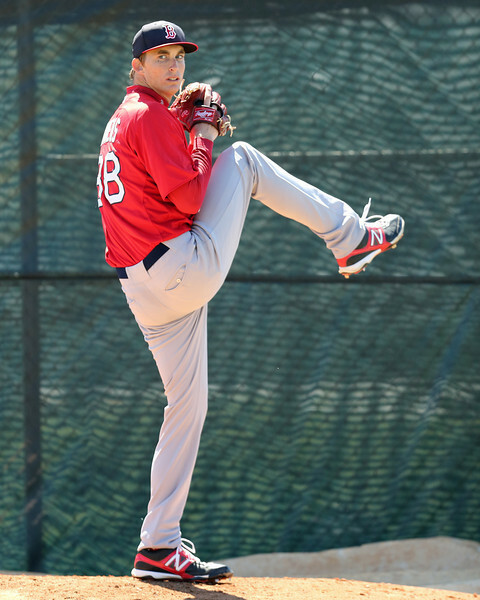 The Red Sox top pick in the 2011 draft notched seven strikeouts while walking only two. A quartet of relievers finished the final 3 2/3 innings. The PawSox scored both of their runs in the first, as a Ryan Lavarnway single drove in Jackie Bradley, Jr. and a rehabbing Brandon Snyder came in on a Bryce Brentz ground out. Lavarnway led the club with two hits. The Double-A Eastern League has announced its Year-End All-Star selections, and the Portland Sea Dogs are represented by right-handed pitcher Anthony Ranaudo. Ranaudo, who was also recognized as an All-Star at midseason, is the first Sea Dog to earn Eastern League postseason honors since 2011, when Will Middlebrooks and Chih-Hsien Chiang were honored. 8/29 Cup of Coffee: Pawtucket, Salem, and Lowell inched closer to playoff spots, while Portland suffered a tough loss that may put them in too big of a hole to climb out of. The DSL Red Sox moved on to the semi-finals, while the GCL Red Sox look ready for the postseason. The PawSox magic number is now three with five games to play after defeating the Syracuse Chiefs (WAS), 5-4. The PawSox jumped out to a three-run lead after Heiker Meneses hit a two-run triple, and Jackie Bradley, Jr. drove him in with a single. The Chiefs got to Pedro Beato for three runs in the seventh to tie it, but Drew Sutton launched a solo home run in the bottom of the eighth to put the PawSox back ahead. Anthony Carter shut the door in the ninth, as the PawSox tightened their grip on first place. According to Brendan McGair of the Pawtucket Times, righthander Matt Barnes is in Pawtucket in advance of his upcoming promotion to Triple-A, though the team has yet to confirm the move or add him to the roster. This is likely the beginning of a slew of roster moves that occur every year around the expansion of major league rosters on September 1. 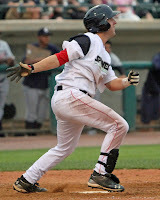 Barnes entered the year as the third-ranked player on the SoxProspects.com rankings after a dominant 2012 season split between Greenville and Salem. While at Greenville he was almost unhittable, allowing only one earned run and four walks while striking out 42 in five starts. The video game numbers did not continue once promoted to Salem, but he still put up very impressive stats: 3.58 ERA, 1.18 WHIP, and 91 strikeouts to only 25 walks over 93 innings. It was his plus fastball and the advanced command and control that allowed him to dominate at these lower levels, and his challenge in 2013 was to work on improving his secondary offerings against the advanced competition of Double-A. 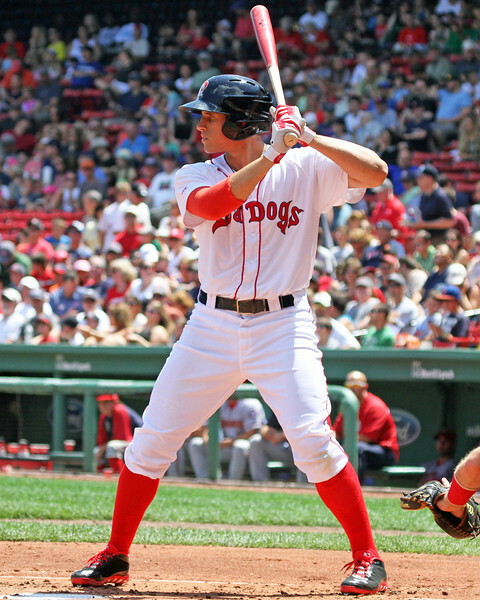 With Xander Bogaerts in the major leagues, the best pure hitter left in the Red Sox minor league system is third baseman Garin Cecchini (pictured). 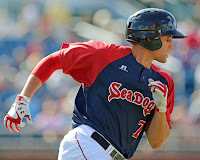 After a blistering start with the Salem Red Sox, during which Cecchini put up a line of .350/.469/.547 in 214 at-bats, he has slowed down somewhat with the Portland Sea Dogs, but he has still put together a very respectable line of .294/.420/.393 in 214 at-bats as of August 27. Cecchini has a solid frame, listed at 6-foot-2 and 200 pounds, but looks bigger than that. He has filled out since he entered the system, especially in his lower half, and has limited physical projection left. Cecchini’s calling card is his hit tool, which is his only truly plus tool. He has plus-to-better bat speed from the left side and a simple, smooth, aesthetically pleasing swing. He has solid swing mechanics, starting with a slightly open stance that he closes on approach. He uses a slight leg lift as his timing device and gets good hip rotation in his swing. He is short and direct to the ball and does an excellent job of staying inside the baseball. He doesn’t try to do too much at the plate, rarely over-swinging or getting caught trying to cheat on a pitch by clearing his hips early. Cecchini has a knack for making solid contact, and even when he gets out he tends to hit the ball hard. He has also shown a willingness to use all fields, but at his best, he works from gap to gap and up the middle. In what was one of the closest votes of the season, GCL Red Sox right-hander Myles Smith earns SoxProspects.com Pitcher of the Week for the week, edging former Red Sox Clayton Mortensen by a single vote. 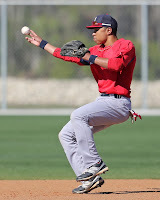 Meanwhile, Salem infielder Mookie Betts (pictured) earns his fourth SoxProspects.com Player of the Week award in what has become a season to remember for the former fifth rounder. Betts, who also took home Carolina League Player of the Week honors, batted .457/.513/.857 over 39 plate appearances last week with a triple, three doubles, three home runs and five walks (one intentional). His season-long reign of terror over opposing pitchers hasn't skipped a beat following his July 9 promotion to Salem, as the 20-year-old is hitting .321/.392/.536 in 190 plate appearances in High-A. Combined with his Greenville slash line of .296/.418/.477, the second baseman is batting .306/.409/.499 for the year. Chris, Matt, Jon, and Ian got together for a super-size episode, leading off with their reaction to the call-up and usage of Xander Bogaerts in Boston. They also discussed some of the system's hottest players in Mookie Betts, Henry Owens, and Manuel Margot; the announcement of the Arizonal Fall League rosters; the past month's promotions; and who might get the call to Boston in September. Plus Jon tells a visitor that he's on a conference call. Yeah, things kind of fell apart at the end. 8/28 Cup of Coffee: With the end of the season rapidly approaching, Pawtucket saw its lead for a playoff spot shrink last night, Portland and Lowell's slim chances stayed alive thanks to some great pitching by Henry Owens (pictured) and Jamie Callahan, and the GCL Red Sox are making a push for the second seed in the playoffs. The DSL Red Sox game was suspended due to rain in the ninth, but they are in position to advance to the next round. The PawSox did not allow an earned run, but still fell to the Scranton/Wilkes-Barre RailRiders (NYY), 2-1. Steven Wright was locked in, allowing only an unearned run in six innings, while striking out six and giving up four hits. Brock Huntzinger also allowed an unearned run, and that proved to be the difference in the game. As reported by Peter Abraham of the Boston Globe, the Red Sox have acquired outfielder Quintin Berry from the Kansas City Royals in exchange for right-hander Clayton Mortensen. Berry, 28, was originally drafted by the Philadelphia Phillies in the fifth round of the 2006 draft. His only major league experience came last season as a member of the Detroit Tigers, appearing in 94 games, hitting .258/.330/.684 with two home runs, 29 RBI and 21 stolen bases. ﻿The Arizona Fall League (AFL) released its rosters for the 2013 season this afternoon, and six Red Sox prospects are on the list. Garin Cecchini, Travis Shaw, Derrik Gibson, Keith Couch, Noe Ramirez, and Pete Ruiz will all be playing for the Surprise Saguaros, along with prospects from the Brewers, Indians, Orioles, and Rangers organizations. The Red Sox usually send seven or eight players to the league, so expect another player or two to be added as the final rosters take shape. Cecchini has vaulted himself up the prospect charts this season thanks to a .322/.445/.470 line in 122 games between High-A Salem and Double A Portland. The third baseman is a lock to be added to the 40-man roster after this season since he is eligible for the Rule 5 draft, and the Red Sox are simply sending him to get at-bats and also work on his defense at third base. 8/27 Cup of Coffee: It was a busy night on the farm, where one team began the playoffs, another team punched its ticket, and several more made progress on getting to postseason play. The DSL Red Sox took the opener of their three-game series, while the GCL team is headed for the postseason with the help of a trio of rehabbing arms. Pawtucket walked off to open up its division lead, while Carolina moved one step closer with an extra-inning victory. Portland kept its slim playoff hopes alive in a slugfest, but Lowell's chances continue to slip away after a tough 11-inning loss. Greenville, already eliminated, continues to struggle. It was a stunning victory for Pawtucket, who walked off with a 2-1 win over the Scranton/Wilkes-Barre RailRiders (NYY). Starter Allen Webster was excellent, needing just 98 pitches to get through eight innings of two-hit baseball. However, the one run he allowed had him on the hook for the loss, as the PawSox were down 1-0 when he was relieved by Jose De La Torre. De La Torre pitched a scoreless ninth, and after being shut down all night by Scranton starter Brett Marshall, Pawtucket went to work on the RailRider bullpen. Who will get September call? With roster expansion less than a week away, let’s take a look at the players that the Red Sox may promote from the minors and add to the active major league roster in September. In the past six years, the club has added somewhere between seven and 12 minor leaguers to its active roster each September, in varying capacities. Some have come aboard as impact role players, while others have joined the club just to get their first taste of a major league clubhouse atmosphere. Similarly, some are added immediately on Sept. 1 when the active roster expands from 25 to 40, others are not promoted until Triple-A Pawtucket’s season ends (which is Sept. 2 this season, but could be later as the PawSox have a very good chance at making the playoffs), and still others are only promoted for a cup of coffee during the final week of the season. Here’s the pool of players Boston will look to when considering who will be added this September. 8/26 Cup of Coffee: Victories by Pawtucket and Salem helped increase their playoff odds, while a loss from the Spinners dropped them further back in their playoff chase. Losses from Portland and Greenville rounded off the docket on Sunday. Overcoming an early deficit, Pawtucket came back for a 6-5 victory over the Scranton/Wilkes-Barre RailRiders (NYY). Anthony Ranaudo received the start, allowing five runs on eight hits and two walks in just three innings of work. Chris Carpenter, Chris Martin, Pedro Beato, and Anthony Carter combined for six scoreless innings of relief, helping to lock down the PawSox victory. 8/25 Cup of Coffee: It was a memorable night on the farm, with possibly the best night for starting pitchers that the system has ever seen. See the end of the post for a breakdown of all the performances. The pitching helped lead the affiliates to crucial wins in tight playoff races, with only the Spinners losing ground on the day. Brian Johnson (pictured) was terrific in his Carolina League debut. Despite blowing a late lead, the PawSox managed to escape with a 5-4 victory over the Scranton/Wilkes-Barre RailRiders (NYY). Clayton Mortensen was locked in, pitching seven scoreless innings, while yielding only three hits, one of which was to Derek Jeter. He left with a 2-0 lead, but the bullpen was not able to hold it. 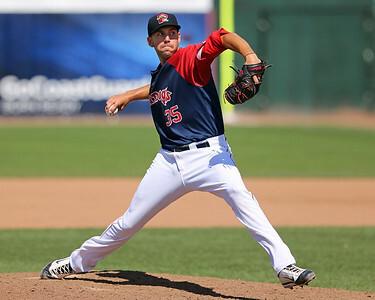 Left-handed pitcher Brian Johnson has been promoted to the High A Salem Red Sox, reports Salem broadcaster Evan Lepler. Lepler also notes that Johnson will make his Salem debut tomorrow, which would have been his normal day to pitch in the Greenville rotation. Johnson, the Red Sox second first-round selection in the 2012 draft, has been outstanding since his mid-July return from a shoulder injury. In six starts since his activation, the 6-foot-3 lefty has a 1.45 ERA and 0.806 WHIP in 31 innings. During that stretch he has 30 strikeouts, 11 walks, and has allowed just one home run. The huge news for Red Sox followers was after weeks of anticipation (maybe months for some of us) Red Sox consensus top prospect, shortstop Xander Bogaerts (pictured, right), finally was called up to the majors. He did not start the first game after getting the call, but did start at shortstop on Tuesday, finishing 0 for 3 with a strikeout. He also came off the bench to play third base in Wednesday's blowout, grounding out in his only at-bat. The plan going forward is to give him intermittent playing time at both third base and shortstop. The move caused a large media response and SoxProspects.com's Executive Editor answered the call by appearing on the Adam Jones Show on 98.5 The Sports Hub, which can be heard here. Hatfield went on to call Bogaerts "the most exciting player they’ve had in the system, period, since at least Hanley Ramirez, if not going past that to the likes of Nomar Garciaparra and so forth." A fact that is hard to argue. 8/23 Cup of Coffee: It was a big day for the affiliates in their many playoff chases. The run was led by Pawtucket, whose victory propelled it into first place in its division. A victory moved Lowell to within a game of first, while the GCL Red Sox maintained their hold of the division lead. The DSL Red Sox have already clinched but continue to roll. Salem moved one game closer to the playoffs with a victory, and a win by Portland kept its long-shot bid alive. Greenville is the only affiliate out of the running for a playoff spot, and the Drive were the only team to fall on Thursday. A 5-2 victory over the Scranton/Wilkes-Barre RailRiders moved Pawtucket into a half-game lead for first place in the International League North Division with 11 games remaining. Steven Wright was solid on the mound for the PawSox, allowing two runs (one earned) on just four hits in six innings, while striking out three and walking only one. Wright got an assist from the bullpen trio of Chris Martin, Ryan Rowland-Smith, and Pedro Beato, who combined to strike out four, while giving up only two hits in three shutout innings. FORT MYERS, Fla. -- The experience of being drafted can be one of the most exciting times in a baseball player’s career. After years of work on and off the field, being selected by a major league team with an early pick is validation of a player’s talent and potential future in the game. Of course, being drafted is also the start of a long journey to The Show. Even the most experienced college players can take more than two years to reach the majors, and for high school players, four to five years is a more realistic time frame from signing to being ready to assume an everyday role. For the two highest-rated players taken by the Red Sox in June’s draft, first-round pick Trey Ball and third-round pick Jon Denney, that long journey started this summer in rookie ball, specifically in Fort Myers, where they play for the Red Sox Gulf Coast League affiliate. 8/22 Cup of Coffee: The major league team still has well over a month to play in its regular season, but elsewhere the MiLB campaign is starting to wind down. The DSL Red Sox used a dominant pitching effort to solidify their Boca Chica Northwest Division title, while a number of other teams are right in the thick of things in terms of their respective division and wild card races. With a 6-3 win over the Scranton/Wilkes-Barre RailRiders (NYY), the Pawtucket Red Sox inched closer to a playoff spot with a 2.5-game lead over the Norfolk Tides (BAL) in the wild card race. The hype train for Xander Bogaerts was temporarily halted on Monday night when John Farrell’s lineup did not include the 20-year-old shortstop. Perhaps the manager wanted to let the kid get his bearings by spending the night in a big league dugout, but there’s no doubt that once Bogaerts gets penciled into the lineup, plenty of Red Sox fans will be giddy to see him play. To try to put Bogaerts’ call-up into perspective, Adam Jones welcomed Chris Hatfield from SoxProspects.com to the show. He said the excitement surround Bogaerts is certainly warranted. 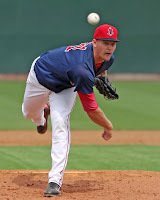 - 2013 second-round pick Teddy Stankiewicz (pictured) is on a very structured program with the Lowell Spinners. He is currently only throwing at most two innings per outing, depending on his pitch count. This schedule doesn’t provide an ideal look scouting-wise, especially since it limits his use of secondary pitches and it doesn’t show how his delivery and velocity will hold up deeper into games. It does, however, provide a good first look and a starting point of things to watch for going into his full season debut next season, likely with the Greenville Drive. I have now had the chance to catch three of Stankiewicz’s outings and he has shown the makings of a solid four-pitch mix along with a projectable frame and workable delivery. Stankiewicz has an ideal pitcher’s build, listed at 6-foot-4 and 200 pounds. Still only 19-years-old, he has room to fill out, especially in his upper body, as he matures without losing any of his present athleticism. Stankiewicz has a loose arm and throws from a high three-quarters slot. His delivery is under control and repeatable, but he drops and drives and has a slight stab behind his body. In three outings scouted this year, he has had some trouble holding his arm slot and finding his release point, especially in the third outing on August 19. 8/21 Cup of Coffee: Anthony Ranaudo (pictured) was fantastic for the PawSox, Garin Cecchini continued to get on base, and Mookie Betts fell just short of the cycle for Salem. It was a rough night in the lower minors, as Greenville, Salem, and the GCL Red Sox combined to score only five runs. 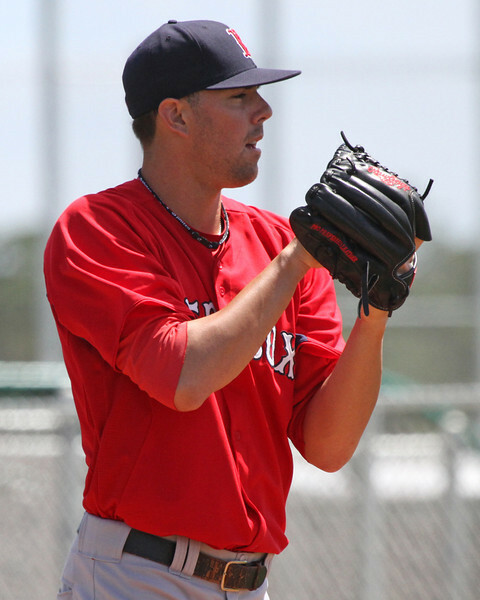 Anthony Ranaudo threw 6 2/3 shutout innings, leading the PawSox to a 1-0 win over the Buffalo Bisons (TOR). Ranaudo allowed three hits and two walks, striking out four, while throwing 61 of his 92 pitches for strikes. His ERA now sits at 1.93 after four starts in Triple-A. Anthony Carter struck out two in a scoreless ninth to earn his 20th save. A pair of minor league left-handers earned promotions on Tuesday, as Mickey Pena (pictured) was promoted to Double-A Portland while Luis Diaz was promoted from Low A Greenville to take his spot in the High A Salem rotation. 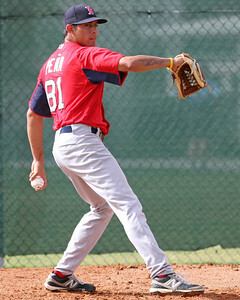 Pena, 22, has made 15 starts for Salem this season, compiling a 6-7 record with a 4.00 ERA. Pena had really upped his game in his last seven starts, pitching 46 innings and allowing just 34 hits and 17 walks while striking out 28. He is scheduled to start Wednesday's contest against New Hampshire (TOR). Pena served a 50-game suspension earlier this season for testing positive under baseball's minor league drug prevention system. The 2011 sixth-round selection had a stellar season last year with the Drive, going 8-7 with a 2.95 ERA in 20 games (19 starts). 8/20 Cup of Coffee: It was a big day in the Red Sox system yesterday with the promotion of Xander Bogaerts. With the playoff push on, Red Sox affiliates went 6-1 on the strength of excellent pitching all the way down the system. Another shutout by DSL Sox pitchers clinched a tie for the division championship. Three Pawtucket pitchers also combined on a shutout. Portland, Salem, Lowell, and the GCL Red Sox each gave up fewer than two runs in their victories, and even Greenville, which took the only loss, saw its starter delivery a quality outing. Pawtucket may be going forward without Bogaerts, but there is plenty of talent on the squad, as evidenced by its 3-0 win over the Buffalo Bisons (TOR). Clayton Mortensen got the start and gave the PawSox six innings of one-hit shutout ball. He struck out five and walked three, and lowered his ERA to 2.95 in moving to 3-0 on the year. Brock Huntzinger struck out two in 1 2/3 innings of shutout relief, and Pedro Beato pitched the final 1 1/3 to pick up the save. The speculation is finally over as Alex Speier of WEEI.com reports Red Sox top prospect Xander Bogaerts has been called up to the big leagues. 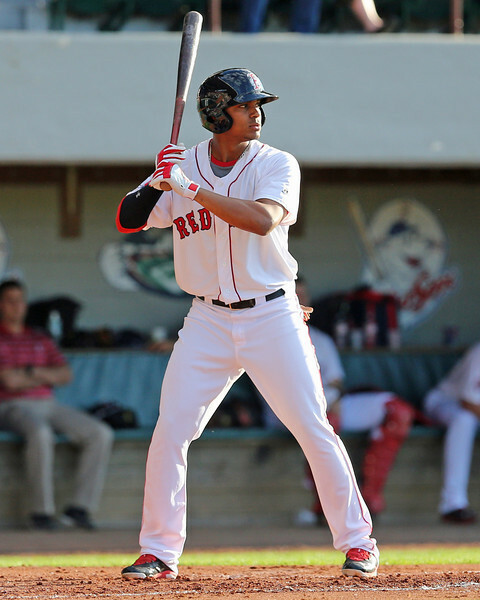 Bogaerts, 20, began the 2013 campaign in Double-A Portland but has spent the last two months at Triple-A Pawtucket. In his 60 games as the youngest player in Triple-A, SoxProspects.com's number 1 ranked prospect batted .284 with nine home runs and an .822 OPS. In 444 at-bats combined between both levels this season, Bogaerts produced a line of .297/.388/.477. While primarily playing shortstop, his natural position, Bogaerts has also played nine games at third base. According to the WEEI.com report, the right-handed hitting Bogaerts is expected to serve in a utility role for the team while playing against left-handed pitchers. FT. MYERS, Fla. -- The focus of Red Sox Nation may rest singularly upon Fort Myers during spring training, but baseball continues nearly year-round at the Red Sox complex at Fenway South. After the major league and full-season minor league clubs depart in late March/early April, the youngest minor leaguers participate in extended spring training (XST)—pretty much what it sounds like—until mid-June. The Gulf Coast League runs from then until mid-September, and the Fall Instructional League (Instructs) finishes the season, running through early October. Last week, with the help of a schedule that had me in Florida anyway on personal business, I took in my first GCL game. 8/19 Cup of Coffee: Pawtucket and Portland both squeaked out victories, while Salem and Greenville split doubleheaders. Lowell continued to play well, walking off with a victory that inched them closer to first place. Strong pitching was enough to lift the PawSox past the Buffalo Bisons (TOR), 3-1. Charlie Haeger picked up the victory, tossing six innings, and allowing one run on three hits and two walks, while punching out five. Anthony Carter picked up the last two outs of the contest to collect his 19th save of the season. 8/18 Cup of Coffee: On a mixed night, the pitching performances of Jamie Callahan (pictured) and Yankory Pimentel were two of the few highlights. Matt Barnes started off strong but faltered in the end, while Xander Bogaerts showed that he still has some work to do on his defense at the hot corner. 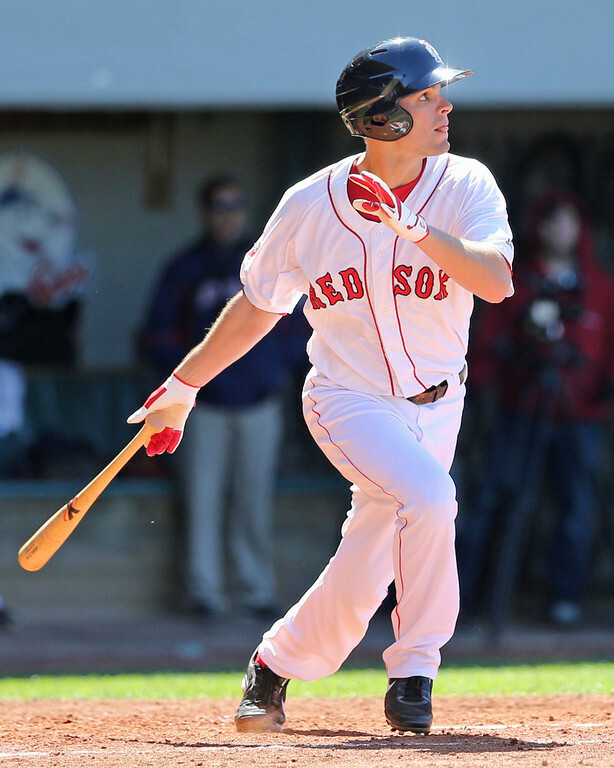 It was a tough night all-around for the PawSox, as they fell to the Buffalo Bisons (TOR), 7-2. Steven Wright struggled, allowing five runs on eight hits in five innings, walking four and striking out three. Chris Carpenter followed with two scoreless innings of relief, and Ryan Roland-Smith tossed a scoreless eighth inning, but the Bisons got to Jose De La Torre for two runs in the ninth to put the game away. 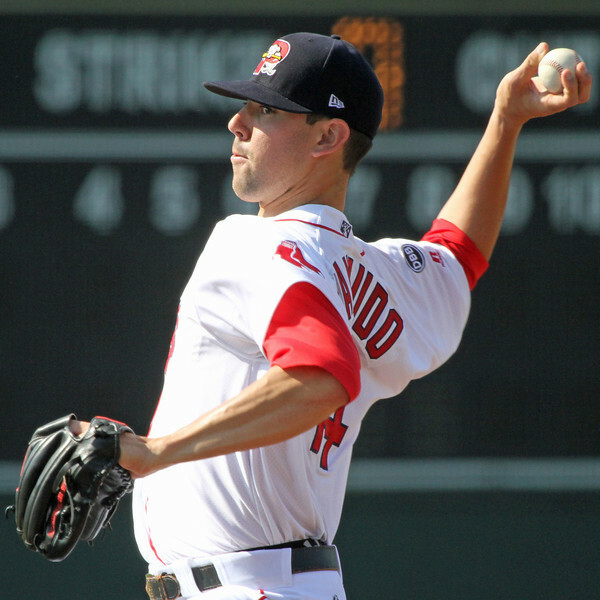 PAWTUCKET, R.I. -- In his McCoy Stadium debut Thursday night, Anthony Ranaudo hardly blew hitters away. He gave up nine hits in his 5⅔ innings of work, including a triple to lead off the game to speedster Billy Hamilton, who later scored. Perhaps more significantly, though, that was the only run to score all night against Ranaudo, who found a way to grind through the outing without his best stuff. "You have to find a way to get outs," Pawtucket manager Gary DiSarcina said. "I know to give up nine hits, he's probably not happy with that, but he got to five-plus innings, and he did what he's supposed to do." "He was grinding that whole game today," elaborated catcher Dan Butler, who has been behind the dish for all of Ranaudo’s Triple-A starts. "He made his adjustments as the game went on. His breaking ball got better and it was more down in the zone." Shortstop Deven Marrero (pictured) was promoted to Double-A Portland this week and impressed in his debut, going 2 for 4 with a walk. 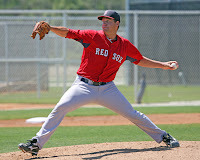 Marrero, the 24th selection in the 2012 draft, is the 14th ranked prospect on SoxProspects.com. As SoxProspects.com Will Woodward notes, the centerpiece of Marrero's game is his defense, drawing him comparisons to the recently dealt Jose Iglesias. Alex Speier of WEEI.com notes the room for improvement in Marrero's offensive game, but also points to a strong walk rate, which suggest a good strike zone management. While the Xander Bogaerts hype train continues to chug along, Red Sox General Manager Ben Cherington threw some water on the coals this week in an interview with Dennis and Callahan on WEEI. Cherington said the decision to promote Will Middlebrooks over Bogaerts was "easier than the public narrative would make it seem." 8/16 Cup of Coffee: It was a day of low-scoring games down on the farm, as no team scored more than four runs, and four affiliates were held to two or fewer. Pawtucket was the high-scorer on the night, plating four in its win, while Salem eked out the systems other win. Greenville took a heart-breaking loss in extra innings, after wasting a standout effort by Justin Haley (pictured). Portland was shut out, Lowell and the GCL Sox never led, and a ninth-inning rally by the DSL Sox fell short. Pawtucket came away with a 4-2 win over the Louisville Bats (CIN) in the McCoy Stadium debut of Anthony Ranaudo. The 6-foot-7 righty pitched out of some jams, ultimately allowing just one run in 5 2/3 innings despite giving up nine hits. Ranaudo struck out three without walking a batter. PAWTUCKET, R.I. — The Pawtucket Red Sox activated Brayan Villarreal from the disabled list Wednesday, and so began a new chapter for the 26-year-old right-handed reliever — a chapter he is very much looking forward to. He pitched a scoreless eighth inning in a 6-5 win over the Louisville Bats (CIN), working around a hit and a walk while striking out one. His fastball reached 97 mph. Villarreal came to the Red Sox in the Jake Peavy deal on July 30 after spending eight years in the Detroit Tigers organization. He was on the DL when the trade went down — a mid-July fall in the shower resulted in a right thumb sprain — and was not expecting a move. Right-handed pitcher Sergio Gomez has been promoted to the Greenville Drive, reports Jon Boswell, Media Relations Director for the Lowell Spinners. The Drive also activated pitcher Francisco Taveras from the disabled list. 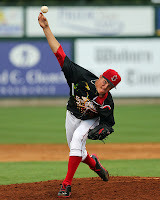 To make room for Taveras and Gomez on Greenville roster, fellow right-hander Gerardo Olivares was moved to Salem. Gomez, 19, has been excellent for the Spinners this season. In 50 2/3 innings across 10 appearances, the lanky Colombian righty has a 1.60 ERA and 1.066 WHIP. Gomez has 55 strikeouts, 14 walks, and has allowed only two home runs on the year. His stellar performance earned him recognition as a New York-Penn League All-Star. SoxProspects.com Northeast Scout Ian Cundall got a look at Gomez in July. Gomez earned a spot start for Greenville before the start of the Lowell season, allowing three runs in four innings. Oliveras will provide needed bullpen depth for Salem after the squad has played 28 innings in the past two days. One more countermove will be necessary in both Greenville and Salem to fit Gomez and Olivares onto the respective rosters. 8/15 Cup of Coffee: On a day when the big league team fell to the Blue Jays, 4-3, in 10 innings, a pair of Red Sox farm teams also went into extras: Portland, who suffered a similar fate to the Sox, and Salem, who came out on top. Xander Bogaerts, meanwhile, helped ensure Pawtucket didn’t need to with another booming home run. The relief corps made it interesting, but the Pawtucket Red Sox held on for 6-5 win over the Louisville Bats (CIN) at McCoy Stadium. 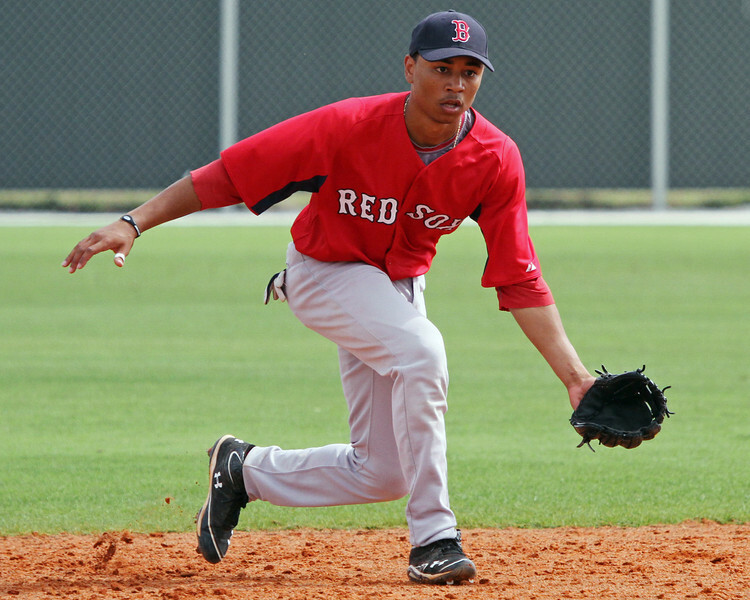 Xander Bogaerts: Top prospect, shortstop, and … bunter? PAWTUCKET, R.I. — Xander Bogaerts was pretty clearly locked in at the plate Wednesday afternoon at McCoy Stadium, rocketing a line drive knocked down by the wind in his first at-bat, then launching a long homer to left-center in his second one. But when the top Red Sox prospect came to the plate for the third time against the Louisville Bats (CIN), he took a bit of a different approach: He showed bunt, initially. In each of the last three years, we've taken a detailed look at New England natives playing in Major League Baseball. We New Englanders undoubtedly enjoy watching our homegrown players succeed -- as long as it’s not in Yankees pinstripes. Here's a list of 32 players from New England high schools or colleges who have appeared in the majors in 2013 (sorted by career Wins Above Replacement). Pena moved to Massachusetts from the Dominican Republic at the age of 12, and spent the next six years living in Haverhill. The 36-year-old also has a few other New England ties, being a Northeastern University alumnus, having played for the Cape Cod League in 1996 and 1997, and having played for both Boston and Pawtucket in 2006. Pena has 285 career home runs and a .465 career slugging percentage. 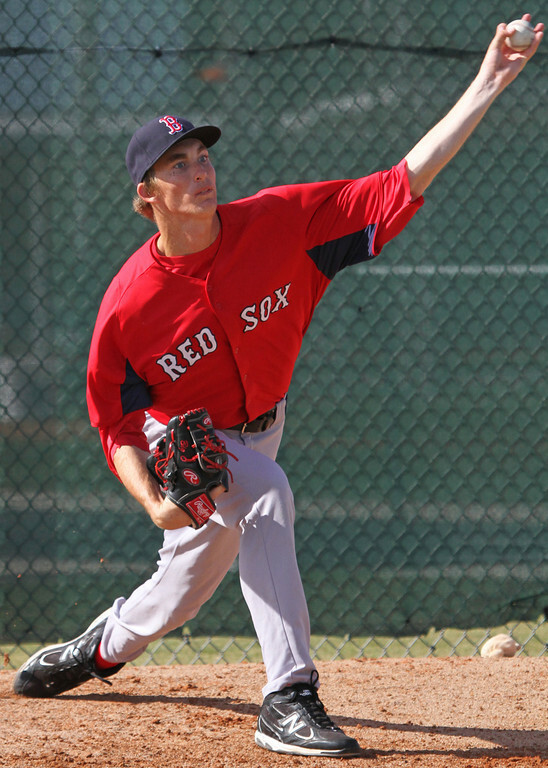 The first thing that stands out when left-hander Henry Owens (pictured) steps onto the mound is his height. Owens is listed at 6-foot-6 and looks every bit that tall. He has an ideal, projectable starting pitcher’s frame, still with plenty of room to fill out as he matures. Owens throws from a high three-quarter arm slot and has an easy, repeatable delivery. From the windup, Owens works from the first-base side of the rubber and utilizes a high leg kick before driving towards the plate. He is balanced in his delivery and did a good job holding his line to the plate throughout the August 9 outing, his second start with Portland. From the stretch, Owens worked between 1.35-1.4 seconds with only a slight leg kick. He was consistent with his pacing and showed strong pitchability. Owens only went four innings, but that was due to his pitch count and not his results, as he only allowed two hard-hit balls for the duration of his outing. Overall, Owens threw 90 pitches, but 67 of those came in the third and fourth innings after he breezed through the first two. 8/14 Cup of Coffee: Xander Bogaerts had yet another appearance at the hot corner, Deven Marrero (pictured) had a strong Double-A debut, and Brian Johnson continued to throw the ball extremely well for Greenville. Both the GCL and DSL Red Sox split doubleheaders, while Salem lost in 18 innings in Wilmington. Mark Hamilton's grand slam lifted Pawtucket to its third straight victory, defeating the Louisville Bats (CIN), 5-1. Xander Bogaerts started at third base on Tuesday, and he went 3 for 4 with two runs scored, and also started a 5-4-3 double play. Alex Hassan reached base in all four plate appearances, going 2 for 2 with two walks, and Jackie Bradley, Jr. went 1 for 3 with a walk. All three of those batters were on base in the fifth when Hamilton connected on his 11th home run of the season to break the game open. In what was a reasonably strong week for pitchers in the organization, Lowell's Daniel McGrath distinguished himself from his peers, taking SoxProspects.com Pitcher of the Week honors by a wide margin; and while SoxProspects.com Player of the Week Mookie Betts (pictured) of Salem didn't face the same level of competition in the polls, he won by an even wider margin. McGrath's first appearance of the week came out of the bullpen August 6 at Mahoning Valley (CLE), where he worked 2.1 perfect innings and struck out four en route to being credited with the win. His second was a victorious five inning start at Staten Island (NYY), perfect again, featuring six strikeouts on August 11. 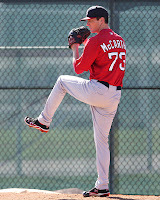 On the season McGrath is 2-2 with a 1.95 ERA in eight appearances (seven starts) between Lowell and the GCL Red Sox, having allowed eight earned runs and 20 hits over 37.0 innings pitched, with 49 strikeouts verses seven walks while holding opposing batters to a .160 average. 8/13 Cup of Coffee: It was a quiet Monday on the farm, with only three affiliates in action. The GCL Red Sox swept a de facto doubleheader, resuming play of last Thursday's game suspended in the second inning before playing their regularly scheduled contest. The DSL Red Sox also had a doubleheader on tap, but after winning game one, the nightcap was suspended in the fourth. Salem took the only loss on the day. Salem fell 7-3 to the Wilmington Blue Rocks (KC). Kyle Stroup struggled in his start, allowing four runs on five hits in only 2 2/3 innings. Mike McCarthy took over in the third and was solid until the seventh when he allowed a solo home run and a two-run blast. In all, he allowed three runs on five hits in four innings. Matty Ott pitched a scoreless 1 1/3, giving up a hit and striking out one. 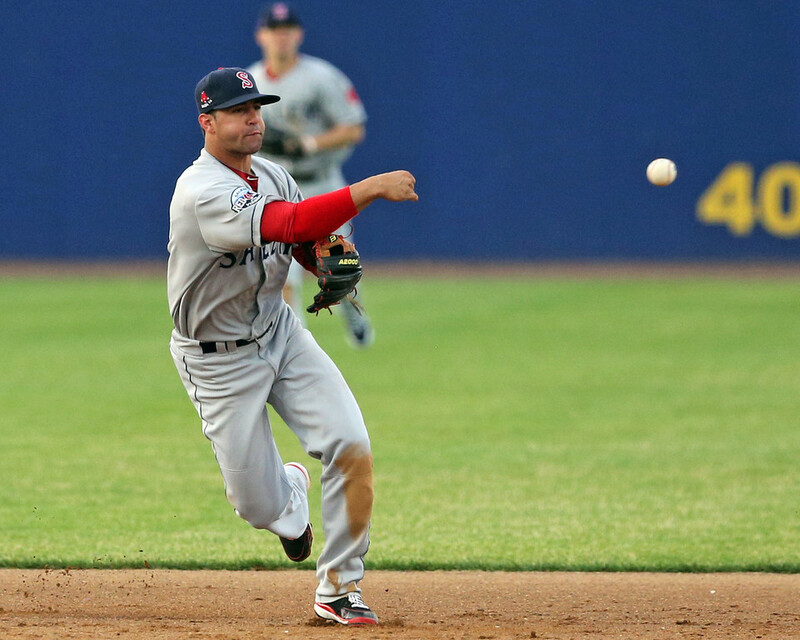 The Red Sox have promoted shortstop Deven Marrero (pictured) from the Salem Red Sox up to the Double-A Portland Sea Dogs, according to SoxProspects.com sources. The Sea Dogs have an off day today, but he will likely be in the lineup and playing shortstop when they return to action tomorrow night at the Altoona Curve, the Pittsburgh Pirates Double-A affiliate. 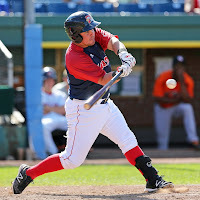 Marrero, currently ranked 14th on SoxProspects.com's rankings, was selected in the first round, 24th overall, by the Red Sox in the 2012 draft out of Arizona State. After being selected, Marrero reported to the Lowell Spinners where he played in 64 games, hitting .268/.358/.374 while stealing 24 bases in 30 attempts. This year while playing for the Salem Red Sox, skipping Low A Greenville altogether, he put up a somewhat similar line of .256/.341/.334 with 21 steals in 23 attempts. 8/11 Cup of Coffee: Saturday was highlighted by strong pitching performances up and down the schedule. No starting pitcher in the system allowed more than one earned run on the day. The DSL Red Sox were carried by Carlos Garcia, who was perfect for six innings. 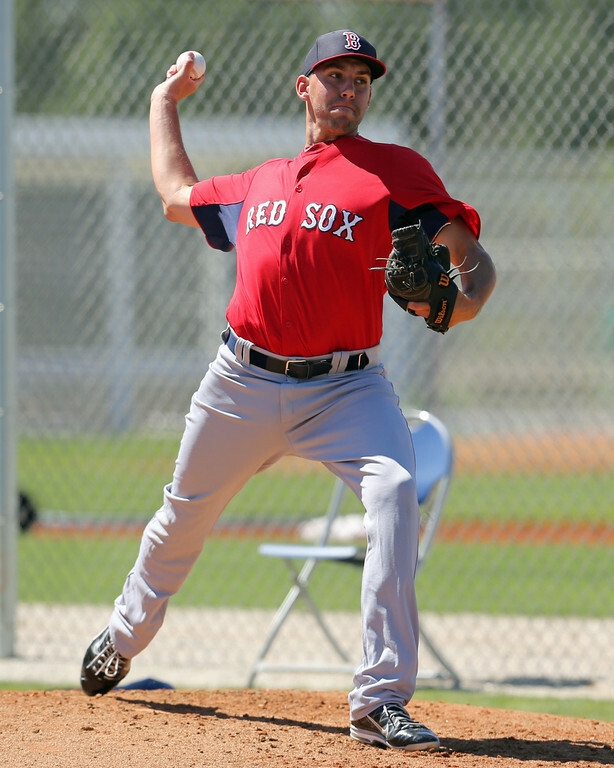 Pawtucket, Greenville, and the GCL Red Sox also got strong outings in their wins. The offense failed to support strong efforts for Lowell and Salem, while Portland was stunned in the ninth. 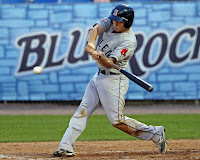 Pawtucket halted its four-game losing streak with a 3-1 victory over the Syracuse Chiefs (WAS). 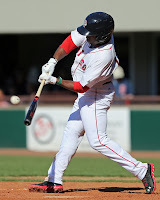 Jackie Bradley, Jr. (pictured) led off the game with a home run, and the PawSox never looked back. Bradley also doubled and walked in the effort. Alex Hassan went 2 for 4 with a walk, and Tony Thomas added a pair of hits. Xander Bogaerts drove in a run in the fourth with an RBI single. 8/10 Cup of Coffee: Portland, Salem and Greenville, all led by big offensive outputs, put up wins on Friday, combining to score 33 runs. The PawSox and the Spinners came up one run short, while the GCL Red Sox and the DSL Red Sox won close games on the back of strong pitching performances. Despite a late-inning rally, the Pawtucket Red Sox dropped their contest to the Syracuse Chiefs (WAS) 5-4 on Friday. Entering the top of the ninth inning, the PawSox were down by a score of 5-3. Back-to-back singles to lead off the inning by Jonathan Diaz and Tony Thomas put runners on the corners for Ronald Bermudez, who hit a sacrifice fly plating Diaz. After Jackie Bradley Jr. was called out on strikes, Thomas stole second base, putting himself in scoring position for Xander Bogaerts, who was unable to capitalize by flying out to left field. PawSox starter Anthony Ranaudo (pictured) was shaky for his standards, giving up eight hits, two walks and four earned runs in five innings pitched. It was Ranaudo's second start for Pawtucket after spending the majority of the season in Portland, where he posted a 2.95 ERA in 109 2/3 innings. The Short-Season A Lowell Spinners today announced that relieve Joe Gunkel (pictured) has been named a New York Penn League All-Star. Gunkel, 21, is in his first season as a professional after being drafted by the Red Sox in the 18th round of the 2013 MLB Draft. The 6-foot-6 right-hander has appeared in eight games for the Spinners, going 3-0, allowing just three hits in 11 1/3 innings. He has also notched four saves, walking just three while striking out 16. Prior to making his professional debut, Gunkel was a member of the West Chester University Golden Rams, leading them to the 2012 Division II National title. Photo Credit: Joe Gunkel by Kelly O'Connor. 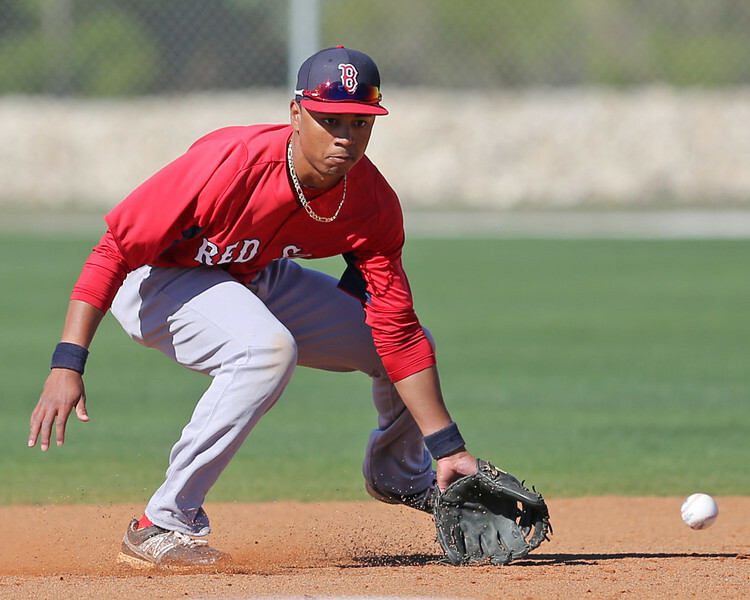 SoxProspects.com Northeast Scout Ian Cundall checks in with his latest Scouting Scratch, highlighting Xander Bogaerts (pictured), Alex Hassan and Dan Butler. 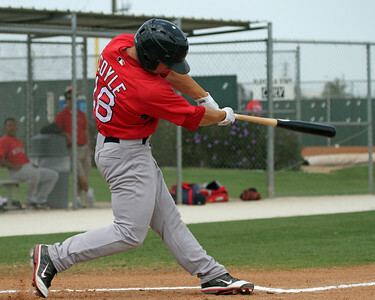 Butler was a recipient of SoxProspects.com's Player of the Month award for July along with Greenville hurler, Luis Diaz. Bogaerts seemingly imminent arrival at the major league level is a hot topic of conversation, with WEEI.com and SoxProspects.com's Tim Healey pointing out that ESPN's Buster Olney believes the talented young shortstop could make an immediate impact at the major league level. Healey also recaps Larry Lucchino's thoughts on Bogaerts from a recent appearance on Dennis and Callahan, where Lucchino talks about how great it will be when Bogaerts arrives in the major leagues. 8/9 Cup of Coffee: It was a tough night on the farm, as Salem slugged out the only win among Red Sox affiliates. Pawtucket was swept in its doubleheader despite a few impressive individual performances. Portland and Greenville also fell, while the rest of the schedule was affected by rainy weather. It was a tough evening for Pawtucket, who lost both games of its doubleheader to the Syracuse Chiefs (WAS). The PawSox managed only five hits in the first game, a 4-0 shutout loss. In a surprise to nobody, Xander Bogaerts collected two of those five hits. Will Middlebrooks and Jeremy Hazelbaker each reached base twice, as both went 1 for 2 with a walk. Charlie Haeger took the loss, allowing four runs (three earned) on five hits in five innings. Haeger struck out seven batters for the second consecutive outing. Jose De La Torre struck out one in a hitless seventh.